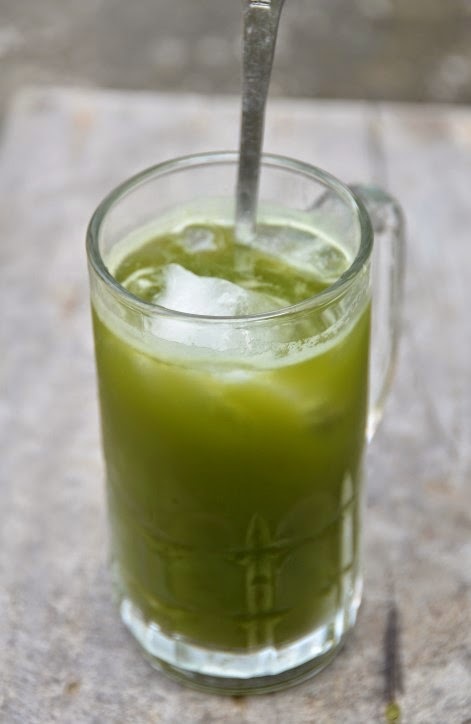 A popular fresh marsh pennywort drink (nước rau má in Vietnamese) has been around for as long as I can remember. In the United States the only time I saw fresh pennywort leaves available in stores was in California. Elsewhere one may purchase it from a can. However, I don't believe the can carries as many nutrients or is as tasty as from making it fresh yourself. My uncle and aunt have been telling me that rau má can help reduce the cough that I have for the last few days. After they said this my aunt came home from the market with a gallon bag of freshly harvested rau má. 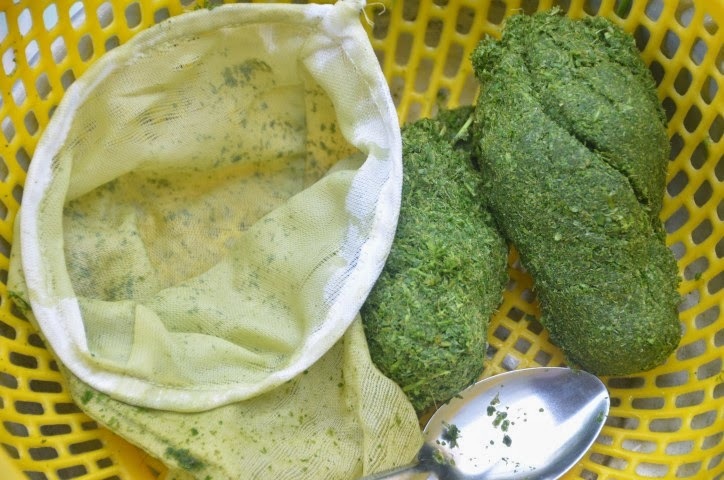 I blended the leaves in coconut water and strained for the juice using an old-fashioned cloth coffee filter. I added ice and a little honey to create my own cough remedy. I created the same drink for my my uncle and aunt and they liked it. However, my uncle said he prefers his drink with less liquid. You can decide what is best for you when you make this. I have been wearing a surgical mask around the house, sanitizing door knobs, and washing my hands with soap constantly for fear one of my relatives would catch my virus. My nearly 95 y.o. grandmother tells me that she is not afraid. She mentions that if she gets a cough it usually last 1-2 days. It sounds as though she has a stronger immune system than most people I know! However, I still need to be cautious. 1) Depending on the size of your blender, you may have to divide the leaves and coconut juice into half portions (as I had to do). 2) Pour half of the coconut juice (about 2 1/2 cups) into a blender. Add 1/4 of the leaves (about 3 oz) and blend to bits. Add another 1/4 of the leaves (3 oz) and blend. Strain to get all the liquid out and discard the green pulp. 3) Repeat the same procedure with the other half batch. 4) Either chill the juice or drink right away. 5) Stir in honey or sugar and ice according to your preference. *Use either a blender or juicer to make this. If you have a juicer then you can easily extract the leaves and stems without using any extra liquid. 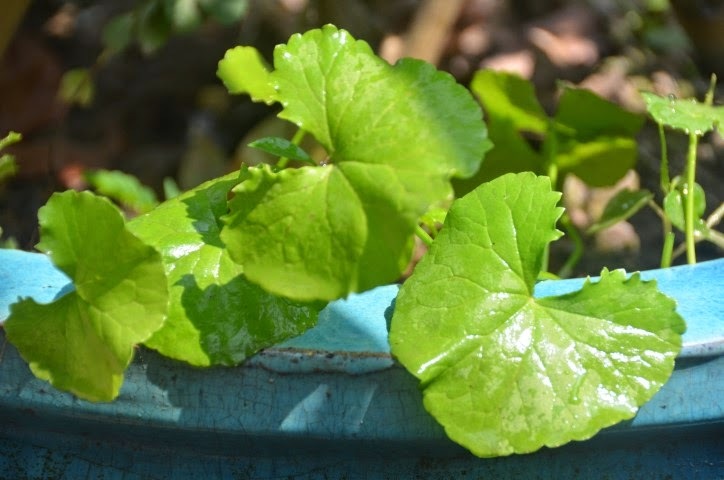 *For more on the many health benefits of pennywort and nutrition facts please read this PDF: Review on Nutritional, Medicinal, and Pharmacological Properties of Centella asiatica (Indian pennywort). 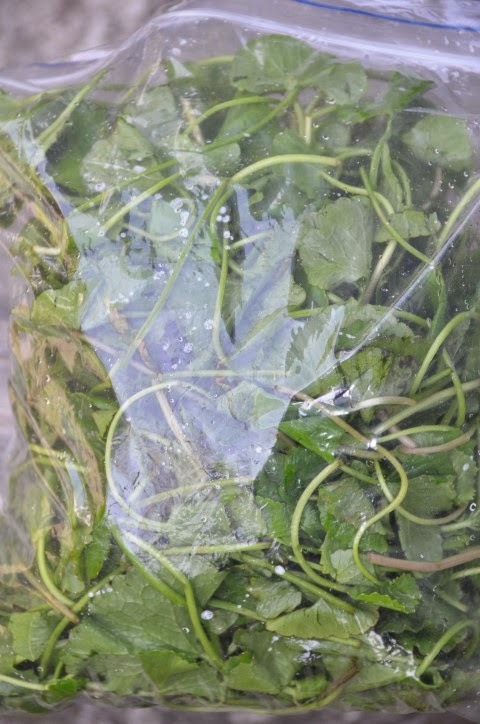 I recently blended 1 kg (2.2 pounds) of pennywort (rau ma) leaves and stems in 600 mL (2.5 cups) water. It is best to add a handful of leaves/stems at a time to blend before adding more. I used a hand-made strainer to squeeze out the juice.